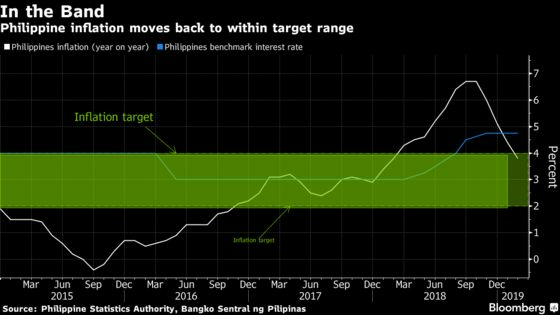 (Bloomberg) -- The Philippine central bank left its benchmark interest rate unchanged in Governor Benjamin Diokno’s first policy meeting, as officials remained cautious even as inflation eases. Bangko Sentral ng Pilipinas held the overnight reverse repurchase rate at 4.75 percent, it said in a statement in Manila on Thursday, in line with the forecasts of all 21 economists surveyed by Bloomberg. The ratio of deposits large banks are required to hold in reserve was left at 18 percent. The central bank said a projected recovery in household spending and the government’s infrastructure program is supporting the economy. However, there are risks including the budget impasse in Congress, it said.